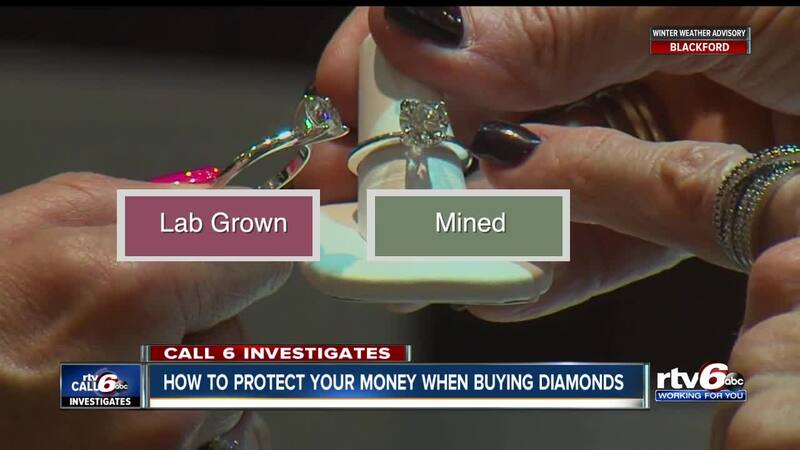 How to protect your money when buying diamonds. INDIANAPOLIS — Diamonds are a girl’s best friend, but are you really getting what you pay for? An Indianapolis woman says her fiancé did not get what he paid for, and she asked Call 6 Investigates Kara Kenney to look into whether her diamonds are genuine, lab grown or fake. An estimated 6 million people pop the question on Valentine’s Day, and many of those proposals will involve a diamond. Sandy Shafer was thrilled when her fiancé Jay bought her diamond earrings from a local mall jeweler, and gave them to her on Christmas. But Sandy started to have doubts, because her fiancé only paid $346 for them, which seemed too good to be true. “Fine jewelry doesn’t come in a box with no name on it,” Shafer said. She also had problems getting the earrings on, because the clasps aren’t big enough.
" If you look at the clasp, it is so small, I couldn't get it on my ear," Shafer said. Sandy took her earrings to an appraiser at the Jewelry Judge, who provided a written appraisal to Sandy saying the stones in her earrings were cubic zirconium. The receipt from the mall jeweler where Jay bought the earrings said they are “lab grown diamonds” which means scientists grow them in a controlled environment in weeks or months instead of what can take millions of years in the earth. Some buyers prefer lab grown or synthetic diamonds because they’re typically 30 percent cheaper and some say they’re more eco-friendly than genuine, mined diamonds. RELATED | Lab grown versus mined diamonds: Which is the better value? But jewelry stores like Metalmark Fine Jewelry in Carmel have a different take. “There's no real value in a lab grown stone, you don't know what it's going to be worth,” Whitney Willhite, store manager at Metal Mark Fine Jewelry in Carmel, said. “You may have invested $10,000 in something that's worth nothing. From a consumer standpoint it's really scary." Lab grown diamonds are chemically the same as mined diamonds, and one of the only ways to tell the difference is for a gemologist to look under a magnifier for a laser inscription on the girdle of the diamond and determine the origin. Wilhite said Metal Mark does not sell any man-made diamonds. “We only sell real, genuine diamonds,” Willhite said. “People love diamonds because they're all unique, they're really sparkly. They just have a lot of life to them." It’s nearly impossible with the naked eye to tell the difference between a lab grown and mined diamond. But if you’re trying to tell the difference between a diamond and a cubic zirconium, it’s much easier to tell. Call 6 Investigates took Sandy Shafer’s earrings to independent appraiser Sherri Roizen. “They’re not consistent to how they’re cut,” Roizen said. Roizen was unable to determine whether Sandy Shafer’s earrings are lab grown diamonds, mined diamonds or fake. "I can't tell,” Roizen said. “They're too small. They're mounted." So, Call 6 Investigates sent the earrings to Professional Gem Sciences Laboratory in Chicago. A week later, we got the results. Sandy Shafer’s earrings are lab grown diamonds, which is exactly what her receipt said and what Shafer and her fiancé thought they were getting. Call 6 Investigates asked Jewelry Judge if they could provide Sandy Shafer a refund, because their appraisal said the stones were cubic zirconium when the laboratory results showed they were lab grown diamonds. Sandy Shafer is working with the Jewelers Vigilance Committee , a group of jewelers that mediates problems in the industry, to get a refund from the mall jeweler that sold her fiancé the earrings. The clasps on her earrings don’t work, plus the receipt does not state the type of metal and is poorly manufactured, said Roizen. “On the receipt it should clearly state was the metal is,” Roizen said. Sandy Shafer and her fiancé Jay have also filed a dispute with their credit card company, saying they did not get the “fine jewelry” they paid for. Roizen said she’s seen plenty of central Indiana consumers get duped when buying jewelry. “I get people that go on the cruise ships and come back with items that are so grossly overvalued that it’s a problem,” Roizen said. If you’re heading out to buy jewelry for Valentine’s Day or any day, here’s how you can protect yourself. Ask lots of questions, including whether the stone is CZ, mined or lab grown. Make sure to get a receipt and documentation such as a diamond grading report, which should detail what kind of stone you have. Roizen recommends going even further in terms of documentation. “Have it in writing, on their sales receipt that they have at least 14 days to get an independent appraiser to have an evaluation done," Roizen said. And lastly, if you have problems, contact the Jewelers Vigilance Committee. As Valentine’s Day approaches, consumers have a lot of options, but make sure you’re getting the symbol of love you’re paying for.